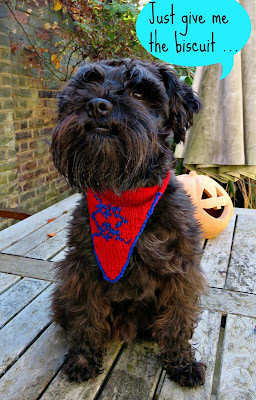 He's watching me with rapt attention because I've got a doggy biscuit balanced on top of my camera, and he's absolutely determined that next door's pesky cat, who's always lurking on the other side of the garden wall, isn't going to get her paws on it any time soon. 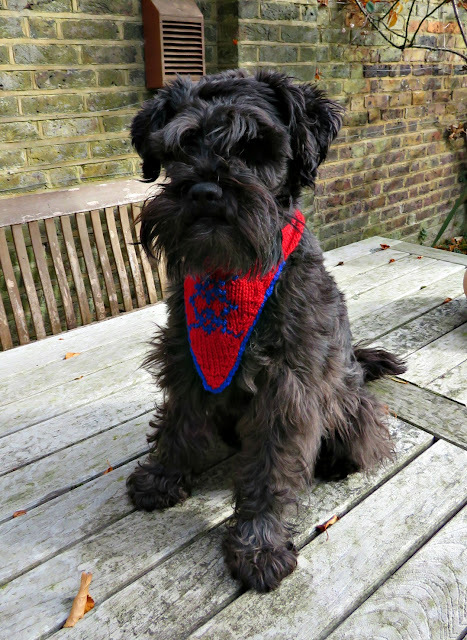 The Wonderdog is a miniature schnauzer, but this size of bandana would work for any small dog of similar proportions. 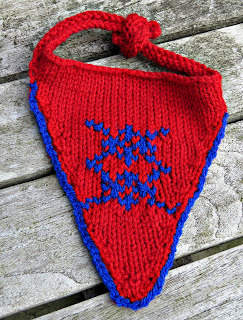 It's been knit with double knitting wool on 4 mm needles, which gave me a tension of 17 stitches x 27 rows on a 10 cm x 10 cm/ 4" x 4" square, and it can be made with scraps of wool from your stash. 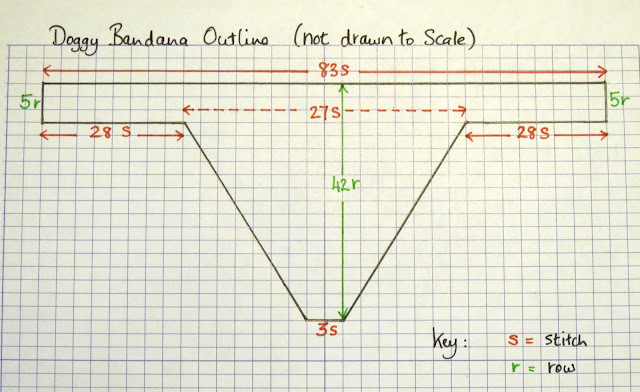 Let me start off with a sketch of what's involved so that you'll understand what we're doing as we go along. 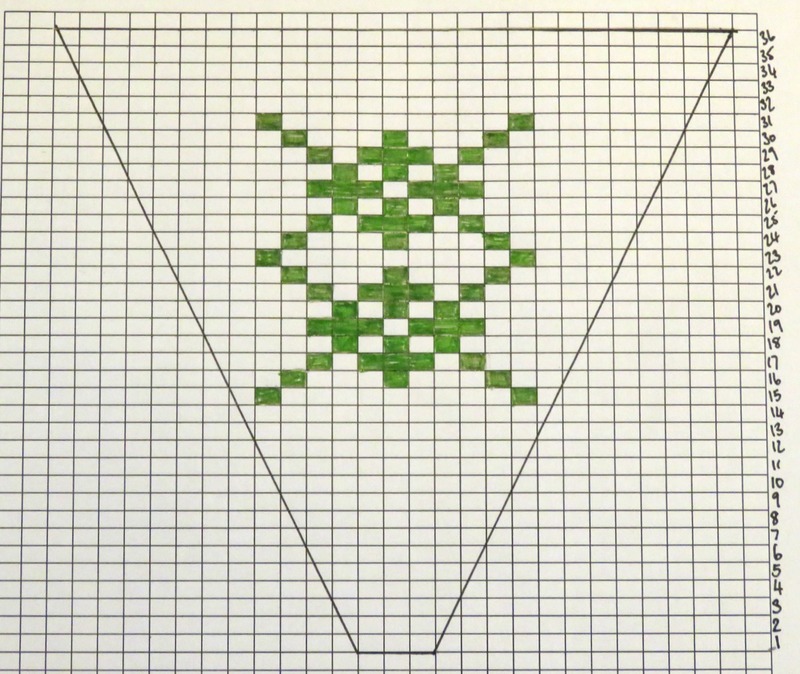 This pattern starts at the bottom with the point (which is actually 3 stitches) and then we work our way up to the ties at the top. 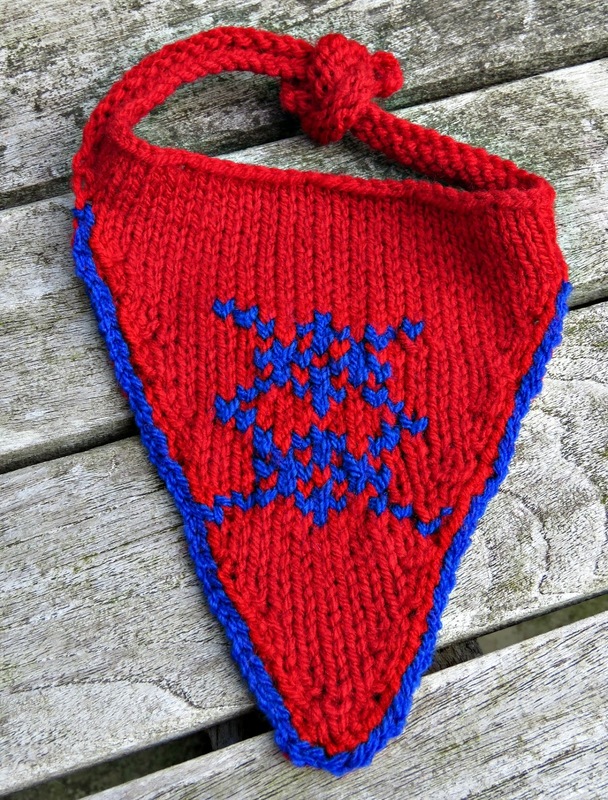 The blue edging is just a single chain of crochet stitched around the edge when the bandana has been knit. The main part of the bandana is worked in stocking stitch (knit all the odd rows and purl all the even ones). Begin by casting on 3 stitches. Row 15: knit - this is the row on which you start the Argyll pattern. And here's a diagram showing how the Argyll pattern works. On this row you knit the first stitch in the main colour, and the second stitch in the contrasting colour. You carry on in the main colour for stitches 3 to 11 inclusive, and then knit the twelfth stitch in the contrast and the final stitch in the main colour. On the following rows (ending with row 31) you need to combine the Argyll pattern with the shaping at either side. Rows 17 and 18: stocking stitch. Rows 35 and 36: stocking stitch. At the end of row 36 cast on 28 stitches using the backward loop method. Row 37: knit across the cast-on stitches and the other 27 pre-existing stitches and at the end of the row cast on another 28 stitches using the backward loop method. Rows 38 to 42: stocking stitch. Cast off knit-wise, darn in your loose ends, crochet around the edge if you want to and block. And that's it: your pooch is ready to promenade in the park with oodles of style and street cred!